Each New Year brings with it much anticipation and excitement for all that it holds in store. Opportunities and potential are limitless but seem to go hand in hand with an increase in your ever hectic schedule. But you can have it all if you simply choose to begin planning right now for your most successful yet relaxed year ever. The secret is finding the time and place to relax rejuvenate each day. And what better place to find that inner peace and calm than in your private meditation garden or Zen garden? It doesn’t need to be a huge space, it can be a tiny secluded spot that allows you to clear your mind and soak in the beauty and peaceful atmosphere of nature. Immerse your senses with the sound of moving water, the aroma of flowers with their vibrant colors and warmth of the sun on your skin. Create your own UNIQUE oasis that speaks to your heart and soul. You will be amazed at the relaxation and rejuvenation that you will enjoy after just a short visit to your own special place. Clear your mind, lower your heart rate and blood pressure and take deep cleansing breathes to improve focus and release the stress which has built up over the course of your busy day. Just close your eyes and imagine your perfect tranquil spot. Think of the smells, the sounds and the images that help you to feel relaxed and peaceful. Next take a moment to jot down a few notes to share with a member of the UNIQUE design team. And even though we are just entering one of the busiest times of the year, the holiday season, know that you have just taken the first step in creating a less stressful, more thoughtful and healthier life for yourself in the coming year. You invest in your work, your family and your future but it is also critical that you invest in yourself, your health and your well-being. Call or fill out our webform today to begin creating your UNIQUE retreat to insure that you are prepared to meet the challenges and attain the goals that you will emerge in the coming year. As a consumer, you might struggle to understand some of the technical jargon and concepts that are an important part of the products that you purchase. And as the size and value of these items increases, it seems that so does the intricacy. As a responsible consumer, we all seek out resources to increase our knowledge in the hopes of gaining the ability and insight to make a well informed selection. But that is not always an easy task. In many industries the only “experts” are affiliated with a certain manufacturer or product line, which will obviously skew their information. What results is a plethora of opinion on industry best products and practices but no honest third part facts. Fortunately, the Genesis program has eliminated this issue in the pool and spa industry. 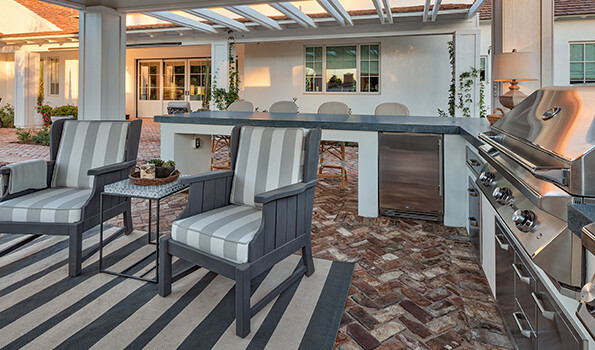 One of the greatest benefits of Arizona is the ability to enjoy outdoor living year round. And with a little assistance from the professional designers and installers at the Unique Companies you can easily increase your usable living space by 50%. An outdoor kitchen and living area offers more than just a place to sit outside, it offers function, space and enjoyment that is only limited by your imagination. So when considering your dream outdoor living oasis, invest time and thought to not only save yourself some money but also to ensure that the Unique team is able to turn all of your dreams into reality.